Home News Is Epigenetics Giving Your Cells Culture Shock? The importance of cell culture in biomedical research cannot be overstated. The ever-increasing reliance on culture systems to usher forth data that can be utilized as models for in vivo biology has raised concerns as to faithfulness of the cultures to mimic real tissue. Scientists from the MRC Human Genetic Unit at the University of Edinburgh, U.K. and Linköping University, Sweden, have published a new study that reveals how quickly cells change their molecular identity when grown under laboratory conditions. The results from this study were published today in an article entitled “Rapid reprogramming of epigenetic and transcriptional profiles in mammalian culture systems” in Genome Biology. “We were astonished by the speed and spread of the changes. Many cultured cells used in research have been grown for decades and as a result are likely to have very different properties from the cells they are supposed to model. Our findings suggest that we have to be circumspect about the interpretation of some previous experiments, and our data reinforces a growing realization that cell line models of human diseases, particularly cancer, can be poor surrogates for many aspects of in-vivo biology,” said Richard Meehan, Ph.D., professor at the University of Edinburgh and senior author on the study. In order to determine the adaptation to culture conditions the researchers isolated genomic DNA from primary mouse embryonic fibroblasts (MEFs) at various time-points and from mixed gender. 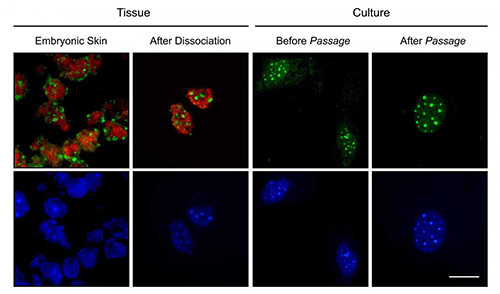 While they found a number of indicators that cultured cells endured an array of changes under the laboratory environment, the most pronounced alteration was observed with 5-hydroxymethylcytosine (5hmC). 5hmC is an important epigenetic marker that regulates gene expression through DNA methylation. Dr. Meehan and his team observed that the MEFs in culture experienced a rapid reprogramming of the epigenome within three days after cell culturing was initiated, which was marked by the global erasure of 5hmC. The investigators found similar results when using mouse CD4+ T cells, in which they observed an approximately fivefold reduction in 5hmC levels after three days in culture. Additionally, the researchers noticed extensive changes in gene expression for over 7,200 genes from the cultured cells. Dr. Meehan’s team surmised that many of these changes reflected the adaptation process onto a plastic 2D surface, as they were genes linked to cell adhesion pathways. Interestingly, they researchers indicated that some of the changes they observed due to cell culture adaptation could be prevented with the addition of vitamin C to the culture media. This would suggest that changes in culturing conditions and media may allow for a better match of cultured cells to the tissues they were derived from.